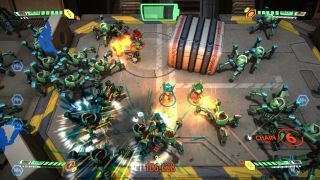 Assault Android Cactus, an Early Access twin stick shooter featuring whimsical aliens shooting at robots, will officially release this 'Summer' (or Winter if you're in Australia). As the video above demonstrates, it's very colourful, fast-paced and–judging by the hour or so I've played of an Early Access build–lots of fun. Developed by Brisbane studio Witch Beam, the game features eight playable characters and 4-player local co-op. If you're impatient, you can always get involved with the Early Access campaign.